As some of you know we have been dealing with the health of our brand new grand daughter Ragan. Ragan was born at 11:29am on March 14th weighing a petite 5lbs 5oz and 18" long. She was healthy and we were so blessed. On her 3rd day home (3/21) which was the day AFTER her first well baby check up, my 23yo daughter Krystina went to wake her up because she missed a feeding and Ragan was blue. They called 911 and she was raced to St. Agnes Hospital in Baltimore (thankfully my sister is a Ped's nurse at that hospital but she was not on that day) and after an initial assessment they transferred Ragan to Johns Hopkins Childrens Center in Baltimore where she remains in Pediatric Intensive Care. We have had many ups and downs, good days and bad days. Ragan was diagnosed with RSV which is common in babies. Because of her low weight and she was two weeks early, she is having a very difficult time getting through it. She was on a ventilator for about 10 days and they removed it yesterday around noon. She did beautifully! She was breathing on her own, nice and pink and up to 7 pounds. We were so stinking happy! But just 12 hours later her xray showed a cloud of white on one of her lungs that were just 12 hours earlier completely clear. We continue to fight the fight. We pray, we send good thoughts, lots of love and all the support and encouragement we can. Please click on the photo below to see it larger. Then could you post it on your blogs, or send it via email, facebook, etc so we can spread the word? Below is text I sent along with it on facebook. Thank you all - every single act of support (kind words, prayers, forwarding this, donations, etc) are appreciated with every single ounce of our hearts. Please share this on your pages. Please ask your friends to do the same. Ragan is still fighting this RSV and having major issues. May be back on ventilator in just a little bit. We want to get the word out. The more prayers, thoughts, words of encouragement, hugs and support these young (23 year old) parents get are most appreciated. 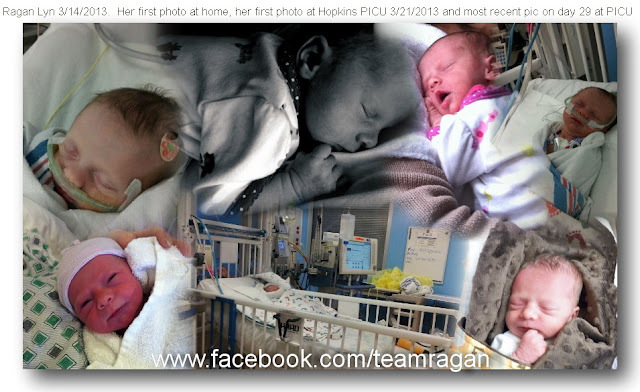 Ragan has been in Pediatric ICU at Johns Hopkins Childrens center for 22 days now. The medical costs are astronomical but the day to day costs of transportation, gas, parking and food have wiped them out. Donation information is on her page if anyone is inclined. More importantly just clicking 'like' is showing support which is a major form of comfort for all of us who love Ragan. Ragan has only been in her own crib for 3 days of her life, we don't know when she will come home but we are confident we will bring this lil one home again someday. Thank you all. Praying for strength and healing for Ragan, for wisdom and peace for her family and for wisdom for those caring for her.